This pair of tongs is very clearly marked "JW". 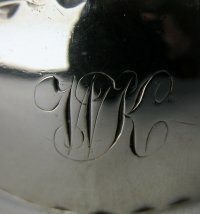 There are not too many Scottish silver-smiths with that mark and the most likely candidate is James Wildgoose of Aberdeen. 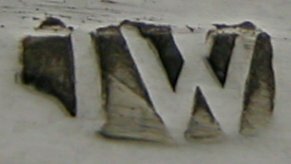 They are Edinburgh marked, but this would be expected as Aberdeen did not have its own Assay office. This meant that work was hallmarked in Edinburgh. This is a lovely pair of flared bright cut tongs. They are monogrammed both on the arm and on the bow, with two different monograms. They are dated c1790.